VectorVest is the system designed from the ground up – and proven – to keep you on the right side of the market. VectorVest is the only stock analysis and portfolio management system that analyzes, sorts, ranks, and graphs over 20,000 stocks each day for relative value, safety, and timing… The three factors you really need to know. VectorVest also displays buy, sell and hold recommendations on every stock, every day. VectorVest gives you the insights, tools and techniques to test your ideas before you trade, so that you can act on them more confidently. 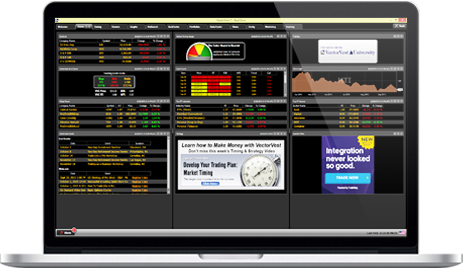 VectorVest’s simplicity and automation make it easy to pick stocks and strategies in minutes instead of hours. Literally. VectorVest delivers objective, independent guidance for independent investors. No hidden agendas and no conflicts of interest. Our only customer is you. Our only benchmark is your ongoing investment success. What is VectorVest all about? In 1978, Bart DiLiddo, PhD began creating mathematical models to clearly define EXACTLY what causes a stock’s price to rise or fall. No opinions or guesswork. Just math. He discovered that all the influencing factors could be summed up in mathematical value models, mathematical safety models and mathematical timing models. Testing and retesting confirmed that his approach reflected market reality. The result – the VectorVest system for stock market trend analysis – has been proven over and over again. Refined, updated and evolved for today’s online markets, VectorVest gives novice investors the simplicity they need, and experienced traders the deep knowledge they seek. Most investment advisors will tell you to buy, but often too late. Or to sell… again, often too late. VectorVest’s clear BUY, SELL and HOLD signals direct you to rising stocks in rising sectors and markets, instead of “good buys” that keep going down: in essence, always riding the rollercoaster to the top of the hill… and then getting off. One last thing. If you’re counting on a broker or advisor for advice, ask them if your satisfaction is 100% guaranteed. Like VectorVest. Test-Drive VectorVest Risk-Free. 30 Days. $9.95. Like a fitness program or a healthier diet, investing more wisely means making the choice to stay with it. VectorVest makes that choice simpler. Spend thirty days discovering VectorVest’s unique simplicity, automation and independent guidance. See and learn how it could help you trade smarter in as little as 10 minutes a day. Hands-on. Thirty days. Under ten bucks. No risk. Why not? Click here or call 1-888-658-7638.